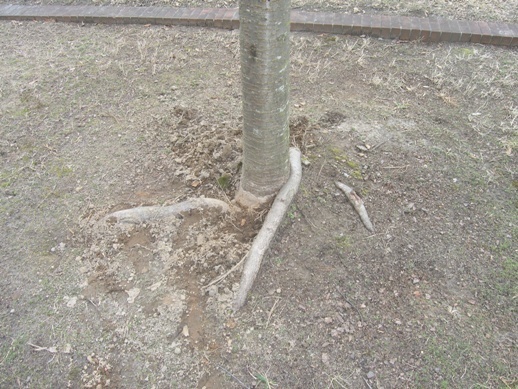 Q: I’ve recently noticed some big roots around the base of my cherry tree and they look like they might eventually strangle the tree trunk. I can’t tell if they’re from the cherry itself or another tree…what should I do? A: Well, we did a bit of digging around the tree and the roots are definitely growing from the cherry tree. This a classic example of the effect of poor growing practices. Most cherry trees are container grown; the tree’s roots grow until they hit the wall of the container and then grow sideways. That sideways growth becomes a permanent growth habit, unless something changes the direction. As for the remedy now, I would cut the roots. The tree may die, but not likely. Most likely will just stunt the growth. But if it is not removed the problem will never go away. Eventually it will either kill the tree or weaken it structurally so that it falls down in a heavy wind.